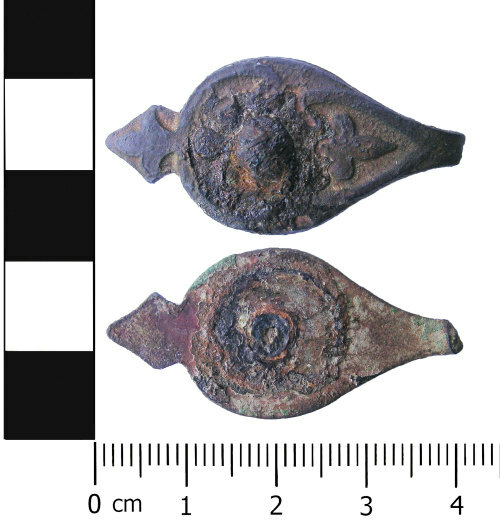 Probably a copper alloy sword belt fitting dating from the post-medieval period, that is c. AD1500-1700. It is complete except for the hooked terminal which is missing. The fitting is tear-shaped with a clear obverse and reverse. In the centre are the remains of a probably iron rivet of which mostly corrosion products are left. There is no decoration and possible remains of solder on the reverse. On the obverse, it i decorated with a heart- and possibly kidney-shaped moulding. Within are moulded fleur-de-lis. There is also a small fleur-de-lis-shaped knop on the side opposite to the broken hook.